Over the years I’ve enjoyed the historical reviews provided by Ted Vincent in our DSE Newsletter. Ted’s writings do a great service, reminding those of us who were part of DSE history, and conveying to later members DSE history. Reading Ted’s most recent article, describing aspects of the DSE’s Bay-to-Breakers, I am prompted to complement his article with additional details which I am familiar as the organizer of the San Francisco Firefighter’s Road Runner’s Club. My first DSE race was in February 1971. The race was the Lake Merced 5 mile course which began just east of the boathouse, circle the lake and returned to the start area. I started running by accident. I had been an avis surfer and lived along the beach in the Sharp Park district of Pacifica. A high school pal, Pat Cunneen, accompanied by daughter Kelly, would frequently run past my residence. At that time my running had been limited to short one mile runs on the beach while I was waiting for the surf to improve. On a couple of occasions, I joined Pat and Kelly in order to have a conversation. On one occasion without awareness I had run three or four miles. Soon after, tired of waiting for the surf, and with a more restrictive time schedule, I went for runs on my own through the (Sharp Park) golf course and around the streets of Pacifica. Shortly after, a San Francisco firefighter, Jerry Cullen, told me of the DSE Running Club. Jerry was a Dolphin Club member and regaled in stories about the President of this club – Walt Stack – and his legendary 17 mile daily runs across the Golden Gate Bridge each morning before he went to work as a hod carrier. Jerry told me they held two practice Bay to Breakers races and that they were a lot more fun than the AAU sponsored race. Plus, these runs only cost a quarter. At that time I hadn’t run seven miles and didn’t think I would ever run more than five. When I ran my first DSE race, Bill Posedel and Ken Scalmanini were two perennial victors in DSE races, typically completing the Lake Merced 5 Mile course in less than 25 minutes (comparable to a 22:30 on our current course). Ken and Bill had both been in the SF Police Department. First Bill transferred to the SF Fire Department and Ken followed several years later. Other prominent DSE firefighters in the late 60’s and early 70’s included Tony Simi, Bill Richardson, Terry Millard, Tom Ryan, and several others that are not popping into my brain at this moment. The point is that DSE had a history of firefighters participating as far back as 1971. I had such a good time at my first race that I encouraged other firefighters and friends to participate. In September 1971 I transferred to a fire station located on 26th Avenue in the Richmond district, and began running regularly in Golden Gate Park before and after my 24 hour shift. Soon other firefighters from my station joined the daily runs, and within six months a number of firefighters from elsewhere in the city were showing up in the morning and running around Golden Gate Park, Lands End, and various routes in the Presidio. On a few occasions we ran from the fire station to my home in Sharp Park. During these training runs I talked of the DSE, its races and awards program, and encouraged many firefighters to participate in DSE races. In 1979 we organized our first fire department competition in a DSE race – the Practice Bay to Breakers which still takes place on Mother’s Day. We had two divisions – one for single company stations and a second for multi-company stations. Our first “Interstation Competition” went off nicely, and 44 firefighters ran the 7.6 mile course from Spear and Howard to Ocean Beach. Our second year we more than doubled to just under 100. By 1985 we had over 185 firefighters participating in the Practice Bay to Breakers. The number of participants as a result of the firefighter participation was far greater because the firefighters families and friends were also running. Fire engines, Rescue Squads, and trucks appeared along the route to encourage safe passage and rooting runners onward. My memory is that there were over 1300 finishers in the 1985 Practice Bay to Breakers (I typed the results). Our last Bay to Breakers “Interstation Competition” was in 1986. 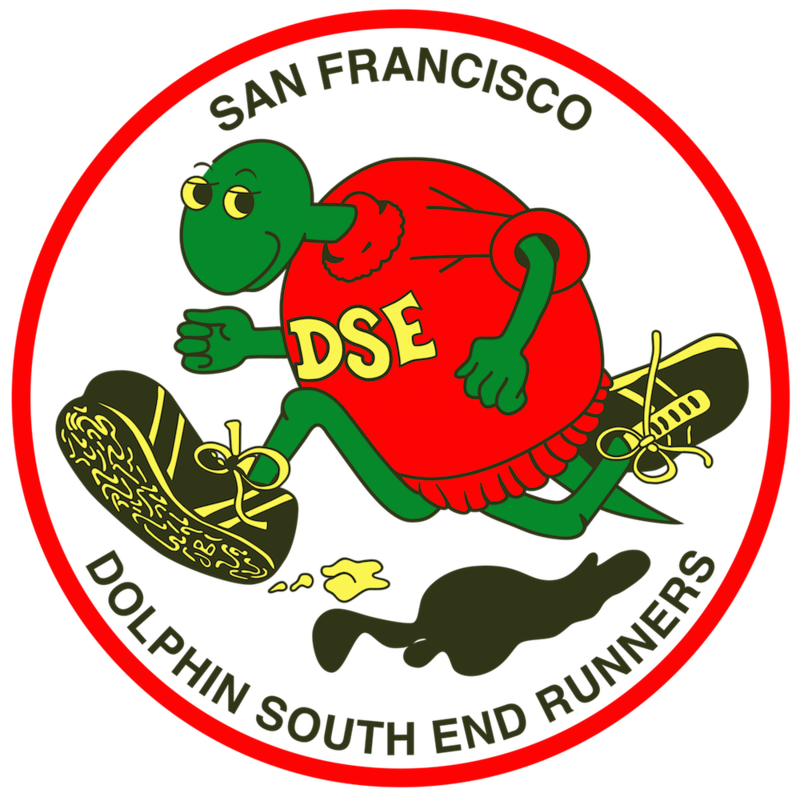 On more than one occasion Herb Caen (famed SF newspaper columnist) referred to the DSE Practice Bay to Breakers as the “real race”, as the Examiner’s run had already become a costume party. Now we come to the part about the withdrawal of San Francisco firefighters from the DSE race. St. Joe Rossett of the SF Police Department was in charge of parade permits, which meant if you wished to do something on the streets of San Francisco you needed to satisfy the SFPD permit process. At that time, DSE did not do permits, didn’t have insurance, and certainly didn’t have (course) monitors. Early in May 1987, I received a phone call at the fire station, and a man introduced himself as Sgt. Joe Rossett of SFPD. He told me that he was considering sending undercover police officers to Spear and Howard on the following Sunday to arrest me and Walter Stack as the organizers of a running event which had no permit. The phone call was merely a courtesy to give me an opportunity to cancel the event. I told him that I had organized a competition among firefighters that was to take place in a race sponsored by the DSE Running Club. He said that he had tried to contact Walt Stack but had not been able to do so. As far as he was concerned, I was the organizer of the race and the person he would hold responsible. I rejoined that it was not my race and it would be up to the DSE to cancel the race, and that I didn’t feel that as a participant we were committing a major crime. Rossett cranked up his emphasis that he would not permit the DSE Bay to Breakers race to occur, and let me know that he would make public my involvement and legal liability so that if anyone was injured during the race they would have his reference as to who was responsible. The image of someone running through a red light, being hit by a passing vehicle is cause for pause; however, especially when you add in a liability suit (directed at me). The DSE Bay to Breakers had become very popular in the Fire Department, so I first went to Chief Ed Phipps to discuss the crisis. He contacted the Chief of Police, Frank Jordan, who in turn contacted Rossett to see what could be done. The next day I received a phone call from Chief Phipps and he told me that Rossett agreed not to interfere with the race if we, the San Francisco Fire Department, would apply for a permit, provide necessary insurance, course monitors, and accept full responsibility including liability. We acted quickly, and with the help of Bernice Rogers, obtained a permit from the Parks & Recreation Department, and our competition moved to Lake Merced where it remains. On the Lake Merced course there are no red lights to run through, one intersection to cross, and another to exit at the start of the race – a manageable course. The DSE has maintained the Practice Bay to Breakers tradition, despite the danger to runners and liability to officers (Note: as of 2004, the Practice Bay to Breakers is now officially designated as a Fun Run, with no race fees, course marking, timing, etc. so that these conditions no longer exist). And it was Len Wallach, the legendary Bay to Breakers Race Director, who championed DSE to continue the tradition along with renaming the event “The Right to Assemble”. Len also issued the first command on the morning of the event: “this is an unlawful assembly, so everyone disperse”.